Spring allergies are here….get relief! Spring – it’s here! Warmer days. Baseball. Patio dining. Buds on the trees. And, the grass is starting to take on that familiar tint of summer green. This is great news for most of us, but if you’re an allergy sufferer, it can also signal the start of a long-term battle to keep your allergies in check. Wait, is it allergies or a cold? After much planning and listening to a new neighborhood tell us what’s important to them, we are excited to open our North Loop Clinic and Pharmacy in April! 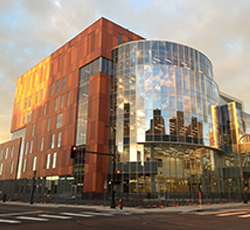 Our main campus in downtown Minneapolis is much more than just a hospital. It also houses a number of primary care and specialty clinics, where we see thousands of patients every year. As the downtown population continues to grow, we’re here to meet all of their healthcare needs from our five-block campus in East Town.